If your gutters aren't installed properly or don't have the correct angle away from your home, you could have problems with overflow and leaks. Luckily, Advanced Basement Systems provides an easy and effective solution for this problem. Our downspout extensions ensure that your gutters move water away from your home, protecting your basement from leaks caused by overflowing gutters. 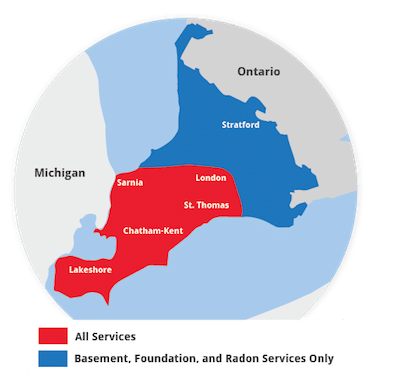 Call us today to get a free installation quote in Chatham, London, Sarnia, Windsor and nearby in Ontario. All of our gutter and downspout products are a great complement to your existing basement waterproofing system! We also offer a wide range of specialized basement waterproofing products for your home. If you've had issues with overflowing gutters or poorly pitched downspouts in your home, call the experts at Advanced Basement Systems for a quality solution. We offer free estimates on all our basement waterproofing services in Chatham, Sarnia, Windsor, London, St Thomas, Stratford, Windsor , Essex, Amherstburg, Strathroy, Leamington and the nearby areas.